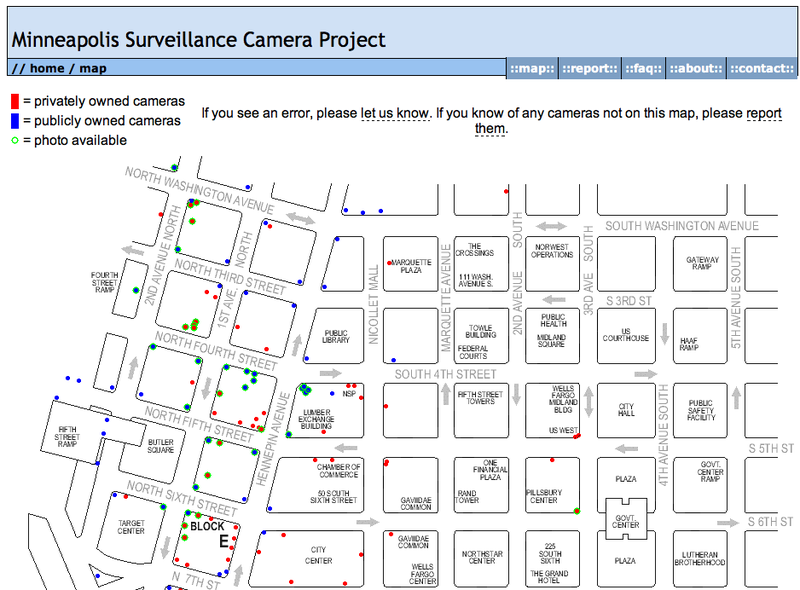 Now that I no longer live in Minneapolis it seems a fine time to shut down the Minneapolis Surveilance Camera Project I launched in 2003. At peak it got mentioned in a few strib articles, was written about in the downtown journal, and got a lot of hits from computers within city and county government. After my initial inventory walk most of the camera additions came in via the website from strangers. More of the reports had photos of the cameras once everyone had a camera in their phone. The whole idea of trying to inventory public and private cameras in public spaces seems silly now. One might as well start the Minneapolis Atom Inventory project -- they're just as plentiful and hard to spot. If anyone would like the mpls-watched.org domain for any reason let me know. It expires in June and I'm happy to transfer it to someone with a use for it. The content still exists within archive.org.